The Adirondack Vets House, Inc., built in 2000, is a 501 c (3) Non- Profit longer term facility for homeless veterans located in Glens Falls, New York. The house can accommodate 9 residents. The house has 3 full bathrooms, a dining room, sitting room, and a renovated basement for limited storage. The house is now an all male facility and handicap accessible. We place women Vets directly into permanent housing. There are no more time limits for our resident Veterans!! Great news!! We have changed to a more permenant housing program to allow Veterans more time to find affordable housing with subsisized possibilities. Also, to catch the Veterans not qualified for other Veteran Programs offerred by the Va. Namely, Vietnam and Korean era Veterans and a catch-all for Iraqi and Afganistan Veterans! Each resident is assigned cleaning chores for the week at the house as well as maintaining the outside and adjoining areas, cooking one meal per rotating schedule, and will be accountable by fair and reasonable rules and regulations to maintain the integrity of the program. The location of the house is within walking distance to the VA medical clinic for medical or psychological assistance if needed. All other appointments that are not in the approximate area can be arranged through a VA van service to accommodate their specific needs. The length of stay for each resident can range from 12-18 months. The cost of this program is minimal. Residents will only pay up to 30% of their monthly gross income which includes meals, utilities, and water and sewer to mention a few necessities. If the residents do not have any financial resources when entering, then the Adirondack Vets House, Inc. will assist by obtaining funds from other programs and private funding as needed to off set the rent barrier. 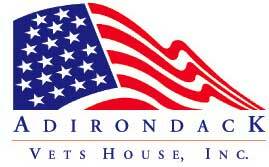 The Adirondack Vets House, Inc. is unique because it is a working program which means most residents find gainful employment and secure that employment for their eventual goal of obtaining permanent housing or appling for pensions, SSD and or SSI. Within the last few years, the Adirondack Vets House, Inc. has expanded their program to include permanent housing for Veterans and their family, as well as an outreach program that assists Veterans with food, furniture, support, both physical and mental. The latest statistics we have gathered reported that Veterans make up as high as 40% of the homeless population in the United States. In some areas, the figure jumps to almost 60% in larger cities. The staff and the Board of Directors meet this challenge by reducing the homeless population by creating programs that fit the needs of the Veteran, because each Veteran is unique and needs a tailor made program to fit that particular need, and not a “cookie cutter” program that works for some of the Veterans some of the time. We help Veterans establish a strong foundation so that they can build their future upon. Because each Veteran joins the program voluntarily, they put 100% effort behind their drive in order for them to achieve their goal of finding a secure job, having permanent housing and staying connected to the resources hub which is the Adirondack Vets House, Inc.
To identify homeless and at-risk veterans in Northern Saratoga, Warren, Hamilton and Washington Counties and to provide them with a safe, stable, and supportive longer term living environment. For those in residence, our mission is to direct them to services from a variety of providers who will assist in preparing them for an independent and productive life after their stay has concluded.